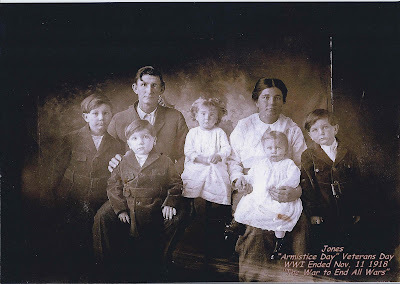 Deck and his family went into town on November 11th 1918 expecting to say good bye to Deck Jones as he was leaving for the army. When they arrived in town, they were told World War I was over. The kids were all in new clothes sewn by Lottie. So they decided to have a picture made. Bertha Mae Jones Hurley, Loyd?s daughter share copies of this with everyone at the reunion this past weekend. Copyright © 2019 Ransom Jones.com. Theme: Himalayas by ThemeGrill. Powered by WordPress.